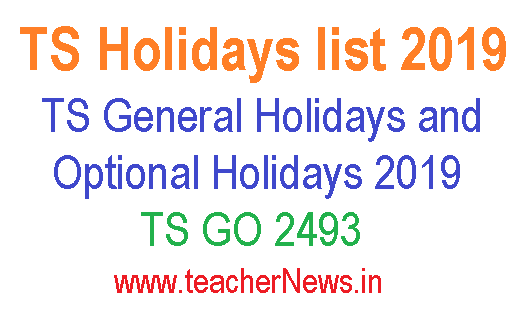 GO 2493 Telangana Holidays list 2019 | TS General Holidays Optional Holidays 2019 Telangana General Holidays Optional Holidays 2019 TS General Holidays GO 2493 and Optional Holidays List for 2019 - List of Holidays: 2019 లో తెలంగాణలో సెలవుదినాలు, TS జనరల్ సెలవులు, తెలంగాణా ఆప్షనల్ సెలవులు జాబితా 2019 తెలంగాణ ప్రభుత్వం సెలవులు 2019 TS General holidays, Telangana HOLIDAYS, General Holidays, Optional Holidays for 2019, General Holidays and Optional Holidays for the year 2019 Telangana Public Holidays The Telangana state government has finalized the list of public holidays for 2019. These include both categories, general and optional. The state chief secretary Shailendra Kumar Joshi released the directives spelling out the holidays. TS HOLIDAYS- General Holidays and Optional Holidays for the year 2019 – Notified. GENERAL ADMINISTRATION (SPL.E) DEPARTMENT G.O.Rt.No. 2493 Dated: 16-11-2018 The following Notification shall be published in the next issue of Telangana extra-ordinary Gazette. The TS govt declared Telangana General Holidays Optional Holidays 2019-20. The Government of Telangana notified the days in Annexure-I (Part I) to be observed as General Holidays. Other occasions/ festivals of general holidays fall on Sundays are shown in Annexure-I (Part II). And The government has also notified the optional holidays in Annexure-II (Part I). Other occasions/ festivals of optional holidays fall on Sundays are shown in Annexure II (Part II). All the state govt offices should strictly observe these holidays for the year 2019. Telangana Holidays list 2019 | TS General Holidays Optional Holidays 2019 Telangana Govt General and Optional Holidays for 2019 Calendar Details GO 2493 Download.